Given the toxic attitude of bot-aspirants toward the reigning government of highsec, it's never a surprise when they vent their impotent rage at "the man". All good citizens of highsec know that the proper thing for miners to do is to pay their taxes, keep their heads down, and say "yes sir" or "no sir" when an Agent comes calling. Unfortunately, some carebears would rather abuse the legal system. Normally threats of legal action don't get very far, because few lawyers would be willing to take a Code-violator's case. Who would want to represent a bot-aspirant, after all? But in highsec, there is such a lawyer. Yes, it's Babatunde B Babatunde, the well-known space lawyer of highsec. From day one, his mission has been to tie up the New Order in red tape and rack up attorney's fees. 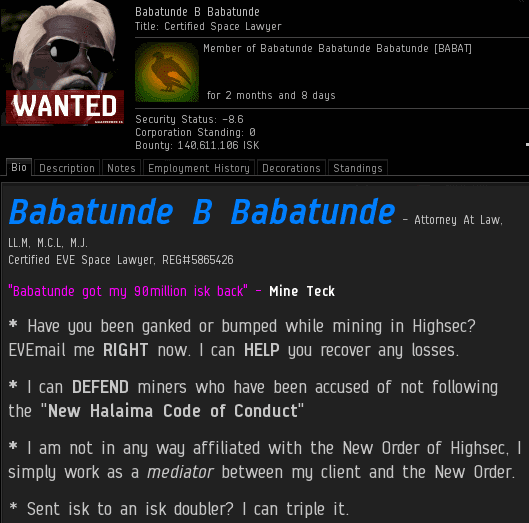 Highsec ice miner Mikalent got into a dispute with Agents of the New Order, so he immediately contacted Babatunde and told him his story. Right away, we can tell this is a frivolous lawsuit. Mikalent didn't get more than two sentences into his story before admitting that he was violating the Code by Skyping with his daughter--when he should have been keeping his eyes fixed on local. Hey, I'm all for family values, but at least ask an Agent for permission first. Otherwise, what kind of message are you sending your child? Because they're protected by attorney-client privilege, clients are encouraged to be totally forthcoming with their lawyers and admit any potential weaknesses in their case. Mikalent confessed that he was "semi-guilty" of AFK mining. Excuse me? The New Order believes in quaint concepts like "right" and "wrong". There are no shades of gray here. The Agent in question, Mister Manners, passed all background checks with flying colors. No one has any dirt on him. Just look at that bio--clean as a whistle. Obviously he was just doing his job, busting punks. According to Mikalent, the Agent on duty could find no evidence that Mikalent owned a permit. But since Mikalent had claimed a permit and was guilty of violating the Code, either (a) Mikalent lied about owning a permit, or (b) Mikalent bought a permit but stabbed highsec in the back by turning against the Code. In either case, Red Pen penalty was appropriate, so an additional 20 million was charged. "Moreover, to ensure the New Order community lives up to my expectations, those who already have purchased indulgences may forfeit their place of honour if they violate the Code." New Halaima Code of Conduct. Mikalent concluded by accusing his friendly neighborhood Agent of discriminating against him and besmirching his name within the community. It's true that the New Order discriminates. We discriminate between good and evil. Since when was it politically incorrect to have the courage to stand up for what you believe in? In the New Order, protecting innocent people and punishing guilty people never goes out of style. As for besmirching Mikalent's name, there's no way for an Agent to be charged with this. Highsec carebears exist in the shadows, in silence and obscurity. No one knows them. They only interact with the game when the Agents of the Order make them interact with it; carebears have no name or notoriety unless we raise them up from oblivion. In other words, we make the highsec carebears. There's no way to besmirch a carebear's name if he had no name to begin with. 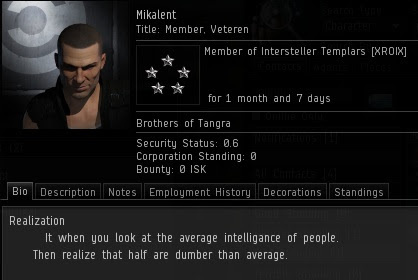 Ultimately, Mikalent apparently left highsec to join a nullsec renter alliance, Brothers of Tangra. Their alliance ticker is "B0T". That's good, because we don't need litigious miners in highsec. I'd rather EVE had B0T-aspirants than bot-aspirants. Yeah its sad how many permit holders turn their backs off the new order after they paid and changed their bio. I came back from a 2 month bumping break and checked the permit holders i sold permits too. Because i care about my customers....and what did i see? 10! yes your read correctly 10! "permit holders" have deleted or changed their bio. I was shocked first, but then i knew...there is only one way to handle this. I revoked this illegal permits nad deleted them from the list. But no worries. I will inform all of them that they are now on the red pen list and what that means. Surely i will give everyone of this 10 individuals tha chance to show honour and buy a valid permit. That seems a bit over the top, obviously if you caught one/some/all of them carebearing in highsec without the bio clause your actions would make sense, but what if they were pvp'ing in highsec, or operating in low/null/w-space? 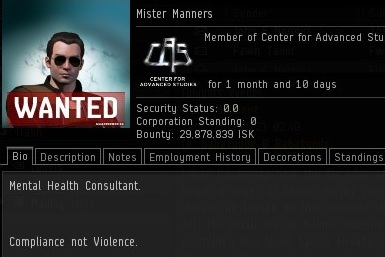 The NO isn't red penning every PVP'er in EVE without a pledge in their bee-oh, are they? The proper order of actions would be to 1. track them down, see if they're operating illegally in highsec or not 2. if they are, kill them and red pen them, preferably killing(podding) them first. Maybe one of these pilots was sold on the EVE-O forums, eh? Now you've red-penned some random person with no idea where he's operating or what he's doing ~_~ That said, if they're not illegally care-bearing in highsec, being put on the red pen list will have minimal impact on them, so it's not a large mistake. Removing the pledge from the bio is an act of miner passive-aggression, and should be punished immediately if still in highsec. If they are now in nullsec, then their actions are not our concern any more, and no harm is done by red-penning them. "Removing the pledge from the bio is an act of miner passive-aggression, and should be punished immediately if still in highsec." Your ability to read is denied, actually, since you've missed the point that I was only talking about former permit holders in highsec who are no longer carebearing/mining at all, rendering your objection moot. All my customers know that they have to imform me of such changes as "moving to low/null/wh" or selling characters. If they dont inform me, then i have to do what is right in the sense of james 315 and the code, so i have to redpen then. If they can proove me that i was wrong, their violation will be removed and it is only 10 million for them. I know i am a very generous person. But how i couldnt be. I learned from the person with the biggest heart in all of eve. if you have read the code and understood it you will know that James 315 is the supreme protector of all highsec miners. And as the agent and the knights act like a proxy for james, we directly represent him. When a permit holder moves to another area, or chooses to sell his mining character he needs to contact his permit delivering agent and inform him about it. If he fails to do so it is the customers responsibility and he has to take the consequences. In this case it is the second code violation by the miner. So he needs to repurchase a mining permit + an additional punishment fee(red pen fee). If the miner successfully provides me proof that shows that he has not violated the code again, i will take him from the red pen list and he must only pay the necessary 10 million isk as he has changed his bio. I hope this clears up your misunderstandings. Since you are not an Agent or Knight of the New Order, you do not have any kind of authority to challenge judgements made by Agents or Knights of the New Order. Objection to your motion's denial noted, and denied. If you wish to use honorable PvP to challenge these decisions, you will need to contact James 315, and undergo one of the three Tests to be allowed to PvP any of us. @trask: "Since you are not an Agent or Knight of the New Order, you do not have any kind of authority to challenge judgements made by Agents or Knights of the New Order." @bruce: "When a permit holder moves to another area, or chooses to sell his mining character he needs to contact his permit delivering agent and inform him about it. If he fails to do so it is the customers responsibility and he has to take the consequences." Moves to another area--out of your jurisdiction, unless the New Order is claiming null/wh space now? Going to need to see a post by James to believe that one. Sells the character--?? You seem to be missing the point of this example. It can't be the customer's responsibility, because the customer quit EVE (with that pilot, at least) and sold his pilot--unless you're copying carebears and making IRL threats here? Perhaps you'd better think this one through again. Illogical and counterproductive? We intend to own Highsec. All of our actions are oriented towards that goal. You simply misunderstand our goals. Our authority is not fallacious. It is very real. Miners who do not obey the Code get exploded. Period. "You simply misunderstand our goals." I understand the goals of the New Order quite well, they are laudable and necessary. The misunderstanding is all yours. "Our authority is not fallacious. " No one is claiming that it is--that's not even a coherent thought. This discussion is a bit over your head, unfortunately. You've already conceded the argument to me-- which you're failing to grasp-- but if you have specific questions that might help you understand the subject, I'd be happy to help. First, the Code violator (henceforth referred to as The Accused) claims he can't run TeamSpeak on his computer. This is blatant absurdity; if he can run the EVE client he can most certainly run TeamSpeak. Secondly, there is only 'guilty' or 'not guilty'. 'Semi-guilty' is, in fact, an admission of guilt. Thirdly, Mr.Babatunde is, to put it mildly, not the legal representation one would want in hisec. He most certainly has ties to Organized Crime, and possibly even...dare I say it...RUSSIANS. Just gaze at his Sec Status...he is an Outlaw, for Chribba's sake. Therefore I must conclude The Accused has no legal grounds for this blatantly frivolous lawsuit, also as evidenced by the fact that the best attorney he could find that would touch the case is the infamous and disreputable 'Mr' Babatunde. No thanks is required, just doing my job. By the way my fee for this consultation is 50 million ISK payable immediately forthwith, and by that I mean now. -------- Mike Adoulin, Space Lawyer, ABC, XYZ, LIC, etc, etc. Woah woah woah, I did what now? Seeing as the BOT alliance is the PL renting alliance I have to believe they were aware of the name they chose and did this on purpose. After all nullsec renter space is about the closest one can get to botter paradise and as far from James315 as possible. a single system for a lone member, a constellation to a budding industrial powerhouse, and everything in between. Can a person use two screens to mine at keyboard while doing a non-eve related activity on the primary screen? Or is this already too far down the slippery slope toward botting in your eyes? Seems questionable at best. I do assume it's allowed to run multiple eve clients at the same time if the primary focus is Eve. After all, an agent with two accounts can convert twice as many miners in the same time or cover more systems. The only thing that matters is that the miner must respond to an Agent's request in local in a few seconds. If he fails to do so, he's AFK. You are incorrect. Please read the Code, it's all there. Your focus should be your mining screen at all times. Glancing away from your screen while mining is a violation of the Code. I punished miners for blinking while mining, let alone looking away. I will be keeping tabs on you, as you appear to be a bot aspirant. Pretends to be New Order while saying dumb things, Bob....mh...Bob? Could you be... Bobbins! Here you are old friend. After pretending to be other agent by poorly disguising as them, you resort to play the dumb-agent character in comments to somehow make them look bad. That's sad, Bobbins. Anon 12:03. You don't have to pretend, we understand. I hope you are not mining right now, and instead are posting this from a station. Don't forget, the only way you can stop being a non compliant, bot aspirant miner is to follow the Code. I urge you to embrace James and the New Order. There is hope for everyone, including you. Bobbins, did you have a mental breakdown? Is Bob your second personality? "Pretends to be New Order while saying dumb things"
I lol'd really hard. Saying dumb things is a prerequisite for being part of NO. Just look at the comments on this site and you'll see what I mean. Can skype but not teamspeak? Dispatching stealth bomber pilot to null to serve client with summary judgment and notice of asset revocation. The real question is: Are these space lawyers Space Bar-certified? Usu ally these la rge gaps in the mid dle of words show that someone is Space Bar certified, but som etimes people are just putting it on their Tab. Space lawyering is srs bizness.